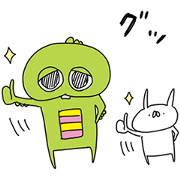 Gachapin drops in to the world of USAGI TEIKOKU in this unique sticker collaboration. Don’t just sit there—hop to it and get all 16 of these adorable stickers! Friend the dinos official account to get them for free. Popular creator hikida’s Betsuni-iijan is teaming up with Gachapin and Mukku for this collaboration set! 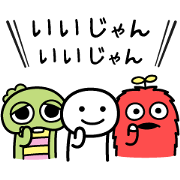 Give your chats something extra with these 16 carefree stickers. Friend the dinos official account to get them for free.